Welcome, August! - Write. Click. Scrapbook. 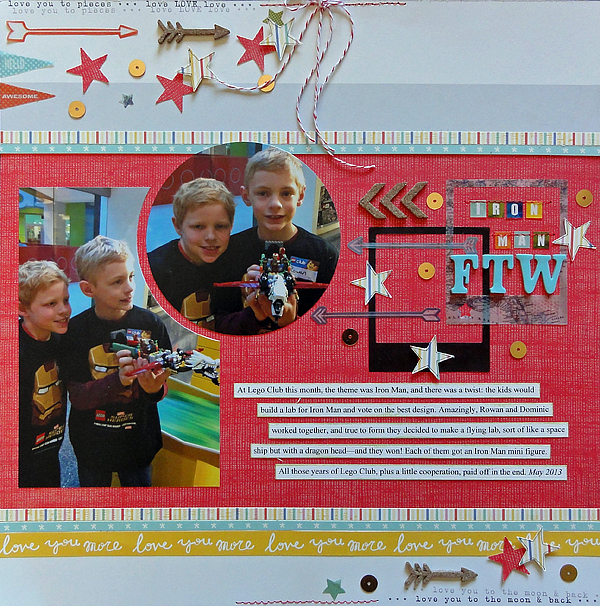 This month our team created layouts using their favorite Go To Designs! From favorite elements to a standby design, there are elements of our pages that define us and keep us moving forward with our pages. Here are some go to designs from our team! Please enjoy. 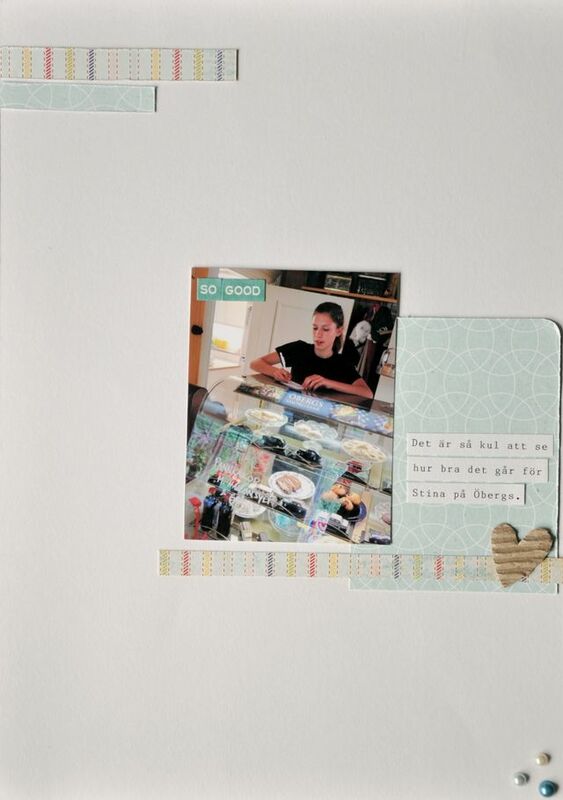 And as always, you may pop over to the photo album to read the journaling and see the layouts!! I used a lot of my go-to elements on this layout. 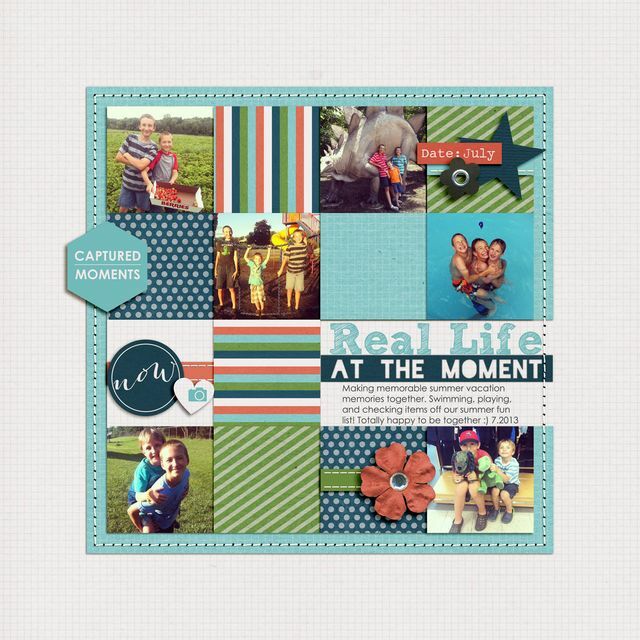 I have used this centered, square design several times, with three photos and one-fourth for embellishment and/or journaling. The tilt just felt fun for a layout about skateboarding. I often add black matte or outlines to my photos and papers. There are so many times I am stuck on a layout, and adding some black around the elements just makes it all feel right. I have a thing for black. This summer, we have all been watching lots and lots of Supernatural. I love that my kids tell me when they think I should close my eyes, because I don’t enjoy anything too gory. I like the feeling that they are looking out for me. This is what happens when I try to not do a linear, even margins grid layout: layered patterned paper with just a couple of elements scattered about the photo. And lots of journaling. In my most often used font, Century Gothic. It's just so clean and easy to read! And I love backlit ponytails. Mmm. I am so excited for school to begin as my oldest is starting high school (woohoo!! how fun is that??!!) and my baby is starting grade one. I miss my babies, but I love seeing my kids bloom and grow. One of my most go-to page designs is the grid. You can have many grid layouts and they can all look quite different. I love the uniformity provided by the grid. For this layout, I worked on each section at a time. Only after each section was done, did I adhere each 3x4 section down onto my 12x12 paper. August is the warmest month in San Diego. We go to the beach but only get in the water if we wear wetsuits. The water is still only 68-70 degrees! This layout is an example of a go to design I like to think of as "snuggle and separate." It refers to groupings that vary in density and proximity, creating emphasis and flow. 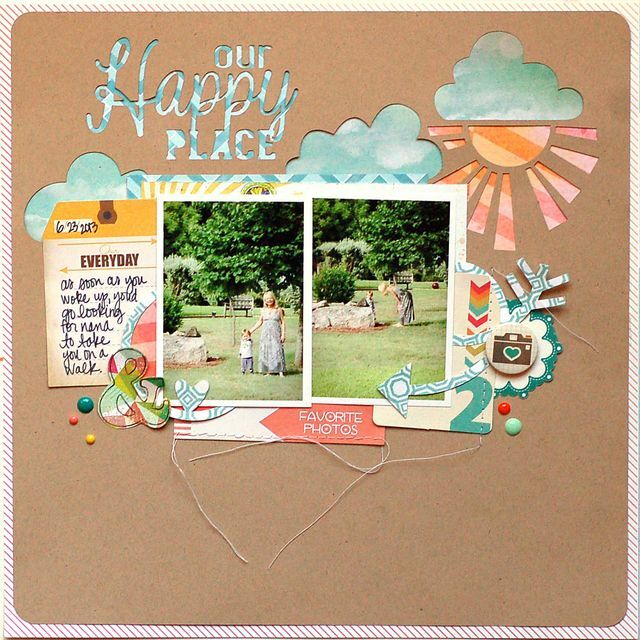 On my page, the photos and title are grouped on larger mats, while the journaling is layered on top of a smaller embellishment collection in the upper RH corner. Because I love to design in groups of three, I couldn't resist adding a very small embellishment cluster at the top LH corner. Although I shot pictures for my high school yearbook, my husband truly is the photographer in the family. This layout is a typical design for me lately. 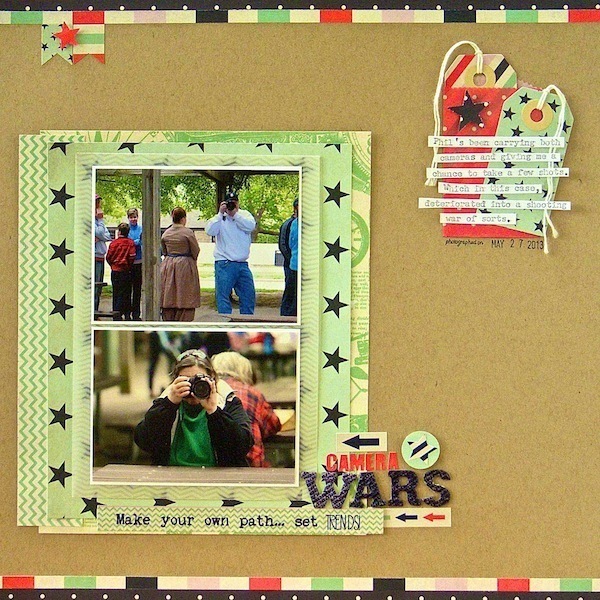 It includes imperfect edge strips, layered bold patterns, some vintage items, buttons and paint splatter on the diagonal. It's my birthday this month! I'm old! My "go-to" layout is definitely something soft, dreamy and beautiful. To get this effect, I usually end up gravitating towards my favorite colors right now….soft pink and white. I always love adding tone-on-tone elements, like the doily, vellum stars, shimmer paint, tissue paper and Silhouette die cuts. I love how they all add texture and dimension, but still keep my layout somewhat calm. I was never a fan of pink as a child or teenager. My love for the color definitely grew much stronger once I had my precious little girl. An off center composition is my go-to design. For this page I've got everything down in the bottom right. 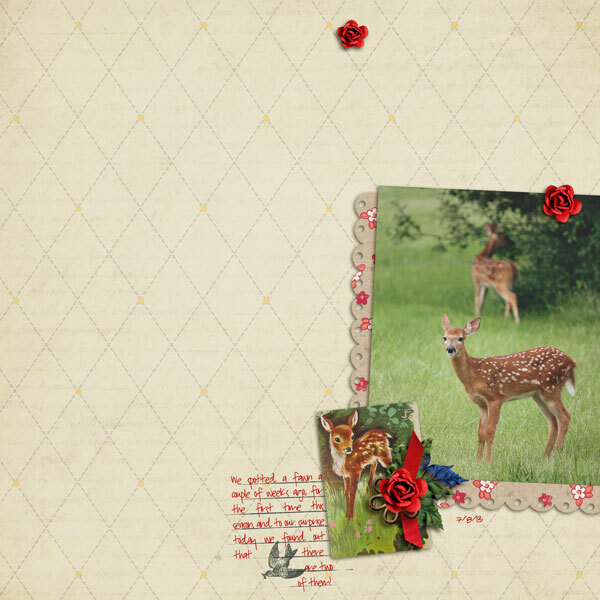 I've used some favorite supplies like a neutral base, wood veneers, mist or paint, layered patterns, text as an embellishment, and photo filters. We recently treated ourselves and bought a Vitamix and I make green smoothies all the time now. I'm addicted! This theme was interesting for me. I love themes that make me think! 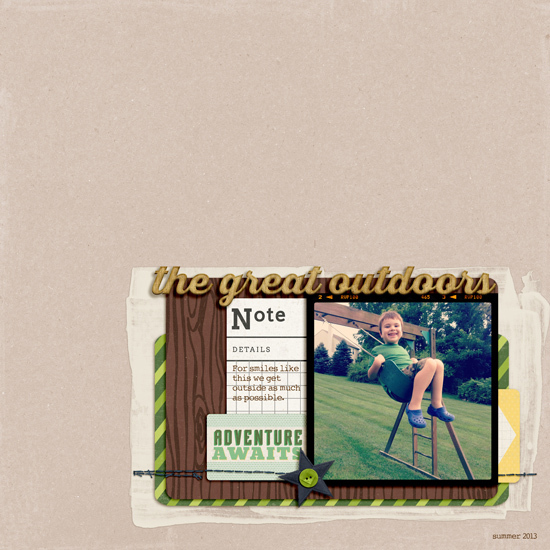 My go-to design when making scrapbook pages is a white background, more often than not I will use a 4x6 photo or at least a bigger sized photo, I often use the rule of thirds and try to make a diagonal line as in my pages here. It makes a page pleasing on the eye. Lately I have been using a bit of layering but use much less materials really. On most pages I use my own handwriting or as in this case I print my journaling since I am a hybrid scrapbooker. So, white background, one photo, composition, layering and hybrid journaling. This layout combines two of my favorite design approaches--a shelf composition, layered over top of a blended background. In many of my pages I turn to one of these "go-to" designs, but every so often I like to combine both of them for a truly unique look. I used a modified template and then created a gradient mask which I clipped my oversized photo of my son to and blend into my background. Our oldest is off to kindergarten this month! My go-to design is a composition with lots of white space, some layering, and journaling to tell the story. For this page, I wanted the photo to shine, since it is dear to me and exemplifies why I love our home so much. I chose a digital kit that had elements and colors that accompanied well my photo, and kept the design simple. My birthday is coming up at the end of the month. Looking forward to using up those birthday coupons for a fun birthday week celebration! 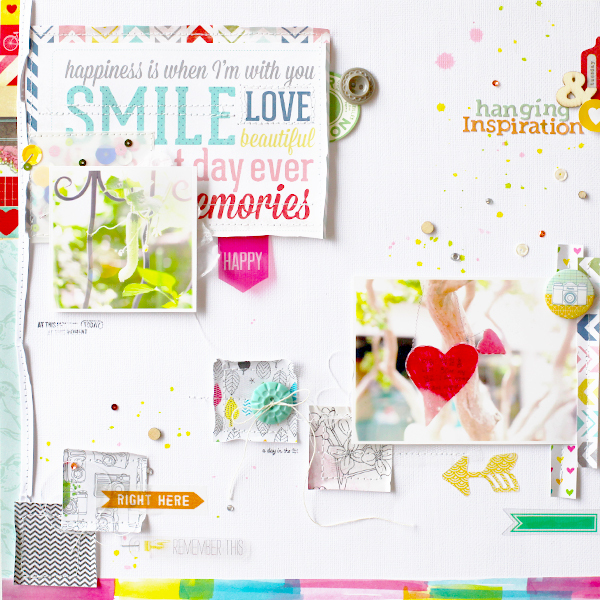 I usually choose the bright colors when designing my scrapbooking page. I think good design is from wonderful color combo. So I try to enjoy it. This layout is a vivid colorfest, no doubt. In Korea, the rainy season is from late June to the end of July. I really hate heavy and boring rain. I'm looking forward to sunshine in August. 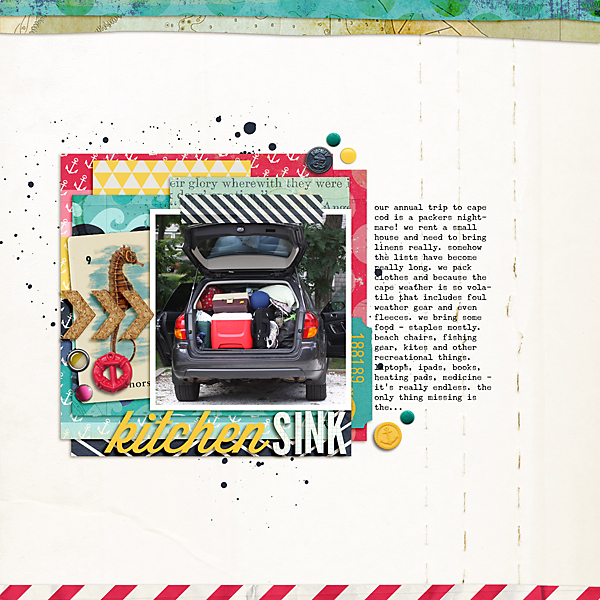 This layout is a combination of my go-to design and go-to scrapping process. 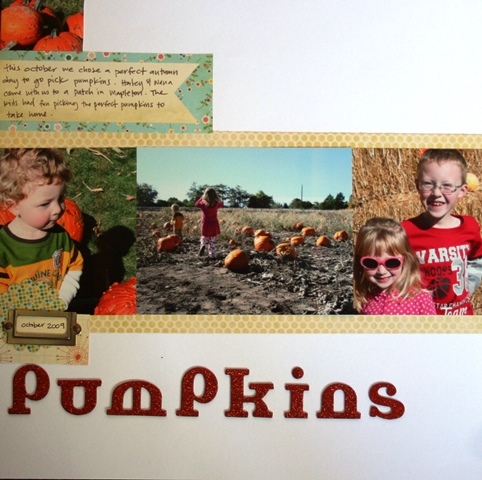 Design wise: white cardstock, large title, 1 photo, white space, patterned paper matte, handwritten journaling. 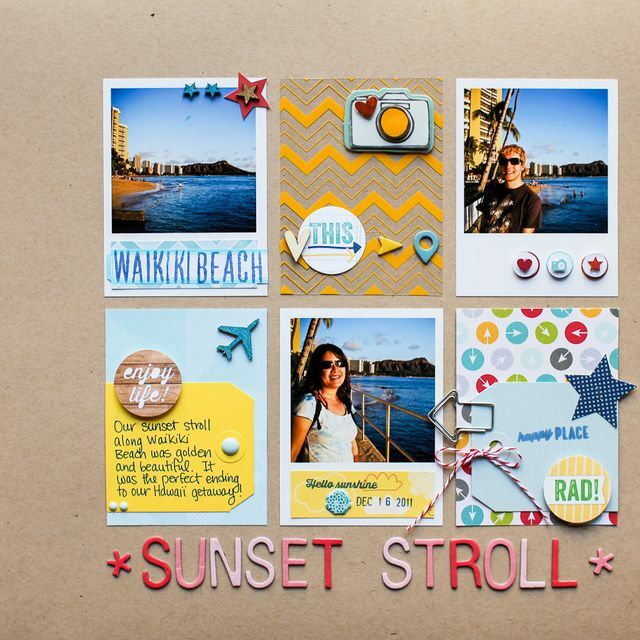 Scrapbooking process: grab a photo, cardstock, a couple pieces patterned paper and a few complementary embellishments. Move stuff around until it looks good. 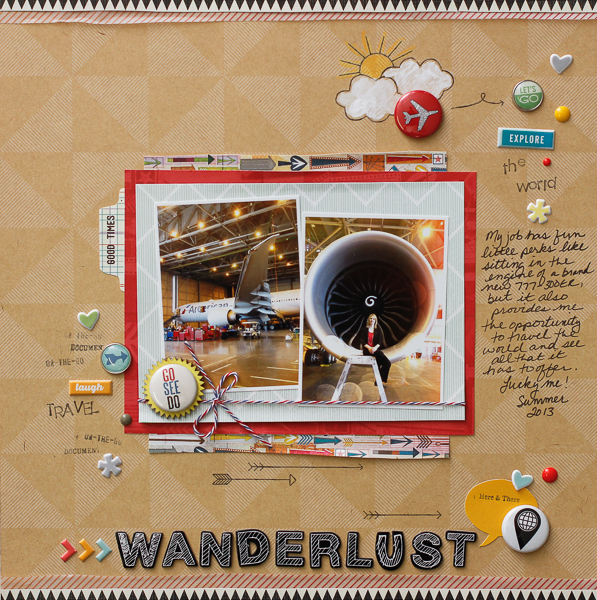 Add title, journaling and embellishments. Works for me! This time of year I would happily eat just fruit and salads all day long. This layout really represents what I love best about creating layouts, layers and lots of them. I like to create layers not just with patterned paper but also embellishments. Along with layers I must have some white space on my layout. I will often add a bit of mist splatter or small enamel dots; on this layout I decided to create chevron circles with gold mist, I like the subtle effect it creates. In August we will be enjoying some much needed camping time with your little ones, I'm looking forward to long days on the beach and cool evenings by the camp fire! 1) I house the photos on a block of patterned paper that stretches across the page. 2) Strips of patterned paper frame the block. 3) The title is highlighted by a cluster of embellishments. 4) I journal on strips that are inked on the edges. 5) Embellishments are clustered on opposite corners of the page. My scrapbooking friends and I call ourselves the Scrappin’ J’s. We go on retreats to scrap several times a year. 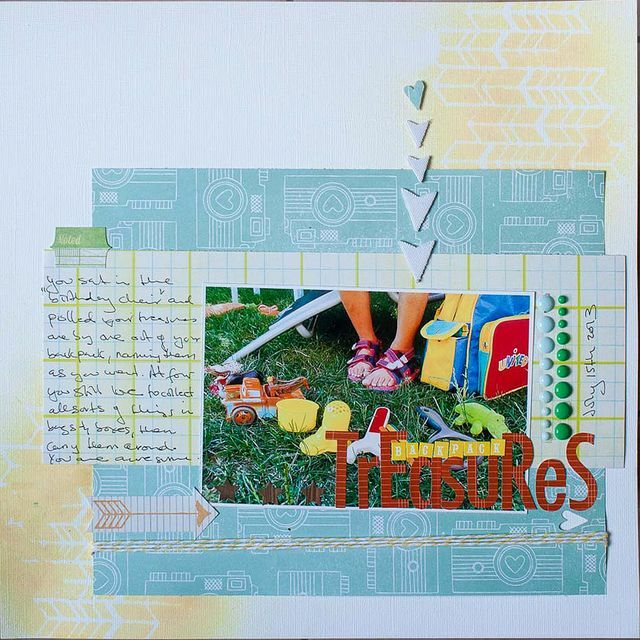 This layout has lots of elements of my go-to design—a rectangle of various layered patterned papers with a title and embellishments along the bottom. Patterned paper is my favorite supply, so I love incorporating lots of different papers on my layouts! August is bittersweet. It is still summertime (the sweet part) but I have to go back to work at the end of the month (the bitter part!). This summer I've felt a strong urge to travel and I dream about going to many new places overseas. I decided to tell the story of how I'm fortunate to be able to do that with some fun photos I took while walking through one of our new 777-300ER aircraft at work. Our youngest took her driver's test last week and is now officially licensed to drive! The hunt is now on for a good used car that won't break the bank. My go-to design is to use a grid on layouts. You can't go wrong with a grid. It makes completing layouts so fast and easy. I don't drink pop/soda (whichever you prefer to call it) and haven't since junior high. I'll just have water please. 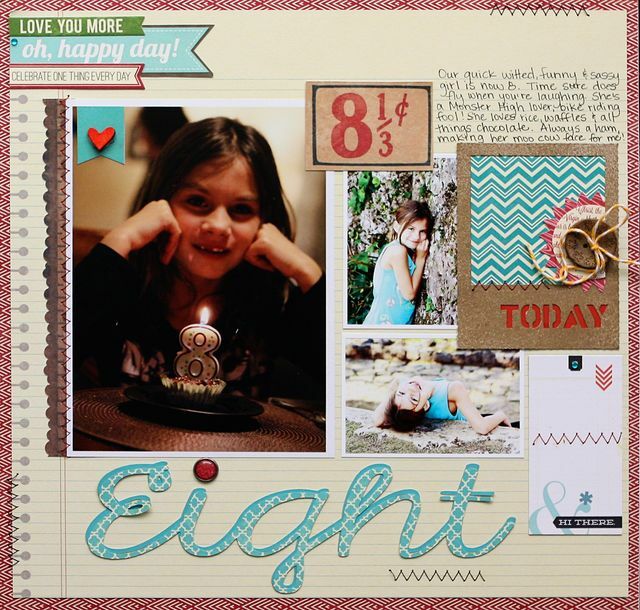 This layout was built around the fun chat mat from Fancy Pants Designs. When I saw it I knew the pictures of my mom with Davis would be perfect for it. I don't like going to public pools. Our neighborhood has a very nice pool, but I can't get past the germs that could be in there so I don't ever take Davis. EWWWWW! As I was looking through past pages for my “go-to” design, I realized that one of my favorite ways to start a page is with three photos. I either line them up vertically or horizontally on my background paper and go from there, adding elements, titles and journaling to complete the page. I also like my photos to touch! Think of me on August 19th! That’s the day my youngest child starts Kindergarten. What a bittersweet day for me! When I think of my go to design this is what usually pops in my head. Multiple photos, a title from the Silhouette, stitching and red in there somewhere! I know color isn't a design, but lately I seem to use at least a little bit of red somewhere in there. I've always loved multi-photo layouts because I seem to have more than just one photo to tell the story I'm trying to tell. This month I send my oldest daughter off to middle school and I'm pretty sure I'm having a harder time with it than she is. Middle school can be a big, cruel world and my heart will go with her every day. 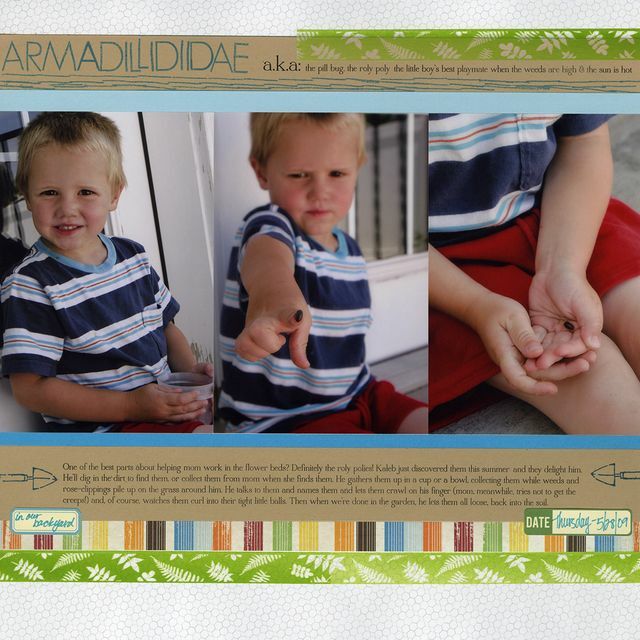 Grouping three 4x6 photos across the width of a layout is one of my go-to design approaches. I always put the journaling right along the bottom of the photos and the title somewhere along the top. I like this because it gives quite a bit of space to include some long horizontal embellishments. I mix up the approach in several different ways: one long 12x4 photo instead of the 3 4x6s, or three 4x8 photos, or two 3x5s with one 4x6 that automatically turns into the focal-point. It's a flexible design that's also sturdy, and it comes up in my albums quite often. This month we're going white-water rafting on the Snake River! Looking back over my last several layouts, I realize more often than not I've been repeating a similar design scheme of placing my photo toward the center of the page, layering various patterned papers behind the photo, and using chevrons or arrows to guide the eye. I guess it's time to switch things up and do a multi-photo layout! I can't stop listening to the Teen Beach Movie soundtrack with all of its catchy tunes. It's my current guilty pleasure! This layout was fun to make. I fell back on a design I use a lot: the grid. A grid is easy to use but rarely looks the same as it's easy to change up little elements for a fresh, new design! August is my birthday month! Grid based multi-photo layouts are always my basic go-to design! You can always keep it super simple and stay within the grid boundaries or layer and add embellishments to jazz the layout up outside of the grid space! On August 3rd I am participating in an attempt to break the Guinness Book World Record for the Largest Parade of MINI Coopers on the Mackinaw Bridge! No goodbyes this month, just four hellos!! We couldn't be more excited to welcome Carey, Sam, Monika, and Kate to our team. They bring with them amazing talent and skillful pages that will be sure to inspire you. And did we mention they are sweet as can be? Please leave them a warm welcome! We look forward to get to know them and for you to do the same! Thank you for stopping by! Enjoy our gallery!